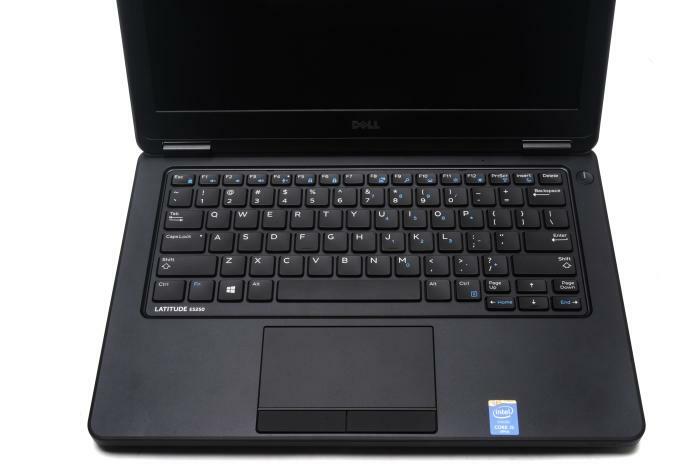 Dell's Latitude E5250 won't look like anything special to most people. It has a square design, a dark, single-colour paint scheme, and its thickness is perhaps a little too much for people who are used to Ultrabook-style offerings (it's almost 25mm thick overall when you include the rubber feet on the base). But it's a business laptop, and business laptops are designed primarily for function, rather than fashion. When you start using it, that's when you realise it's one of most practical portable computers on the market. With a 12.5in screen, the Latitude E5250 isn't large, though it's no featherweight either. It weighs 1.65kg (not including the small power brick and its cables) and that's because its inner workings are substantial. An Intel Core i5-5300U CPU with active cooling represents the focal point of the engine room, and it's joined by 8GB of RAM, as well as a 256GB solid state drive (SSD). The battery is internally situated for neatness, and the design of the laptop as a whole, is one that is based heavily on order as much as it is functionality. You get a slew of useful ports along the sides, including three USB 3.0 ports, a full-sized HDMI port, Mini DisplayPort, and a Gigabit Ethernet port. There is also a full-sized SD card slot, with cards that get swallowed whole, while for security purposes a Smart Card slot resides under the left palm rest. What you notice most, though, is the spread out nature of these features. There are USB 3.0 ports on both sides, plus the rear, and the rear also houses the HDMI, Gigabit Ethernet, and power interfaces. This means that cables jut out of the rear, and well out of the way, while the laptop is tethered to a desk. For most businesses that are looking for functional, easily portable laptops for their fleets, this type of configuration offers plenty of flexibility, depending on the features workers require, and there are a few other things to take a note of that make it attractive for the workplace. Primarily, there is a docking connector on the bottom that can be used to turn the Latitude into a capable desktop system with ease. Meanwhile, on-the-go Internet connectivity is aided by the ability of the laptop to house an internal mobile broadband module -- there is a space for it and a SIM card in the chassis, and the antennas already reside in the screen's frame. You can easily carry this laptop around on a daily basis between the office and your home and everywhere in between, and it can be used for a range of everyday office tasks that mostly involve the running of an office productivity suite and communications. It's not something you could use effectively for things such as image and video editing, and that's primarily down to the screen resolution. As this is a business/office laptop, the big focus for the screen is on easily readable text. For this reason, the resolution of the screen is 1366x768, which doesn't offer much of a viewable area for looking at high resolution photos in detail, nor much screen real estate for multitasking (if you're the type who likes to line up windows side by side, for example). Typing is aided by the inclusion of backlit, chiclet keys that are of a full size, and which have ample travel and softness for long periods of typing. They feel easy to hit and they operate quietly, which should be a consideration if typing is to be undertaken in an office environment with an open-plan design. Another attraction is the solid feel of the keyboard tray: it doesn't bounce at all when you type feverishly. Overall, if you're a typist looking for a laptop with a great keyboard, we'd recommend this Latitude with ease. The keyboard is comfortable and easy to hit for long periods of time. Its touchpad has an area of 100x52mm, with soft and silent physical left- and right-click keys. It responded well to the travels of our fingers, and it was capable of recognising gestures such as two-finger scrolling, two-finger taps, and three-finger swipes. We like the overall build quality of the laptop, which feels assuredly solid when you pick it up and lift its lid, and it's heavy enough so that the lid can actually be lifted open with one hand when the laptop is sitting flat on a desk (great for when you don't want to put down your morning coffee). The metal hinges are strong in this respect, and they stand tall at both sides of the chassis. In a fit of neatness, Dell has made openings within these hinges at the base and placed the power and Ethernet ports in their locations. It's a good look, and a spacious layout to boot. A removable bottom cover allows for easy access to the internal configuration and the battery. Its two SO-DIMM slots are front and centre should you need to make changes to the RAM capacity, and there is a 2.5in drive bay for the SATA-based SSD that sits directly next to the 38 Watt-hour battery. During our battery life tests, in which we disable power management, enable Wi-Fi, maximise screen brightness, and loop a Full HD, MP4 video, the Latitude lasted 5hr 20min, which is a decent sort of a time for a laptop of this size and power class. Speed was more than adequate. The 5th generation Core i5-5300U processor recorded a time of 42sec in our Blender 3D rendering test, which scales well against the performance of similar laptops we've seen, such as Lenovo's X1 Carbon, which we saw with a Core i5-5200U CPU, which recorded 46sec in Blender 3D. The fan makes some noise when the machine is processing a workload, but we didn't find it to be annoying, and the heat on the base was also within reason. That said, you should aim to not block the bottom vents by using the laptop on a solid surface, rather than your lap, when the laptop is busy with a processing load. Storage performance from the 256GB SSD was okay for the most part. We'll give praise to its sequential read rate of 524.3 megabytes per second (MBps) in CrystalDiskMark, but express some disappointment at its sequential write speed of 244.7MBps. A rate closer to 400MBps would be nice for a laptop in this price range. The price is indeed quite high for a business laptop such as this, but it's not an out-of-the-ordinary price. 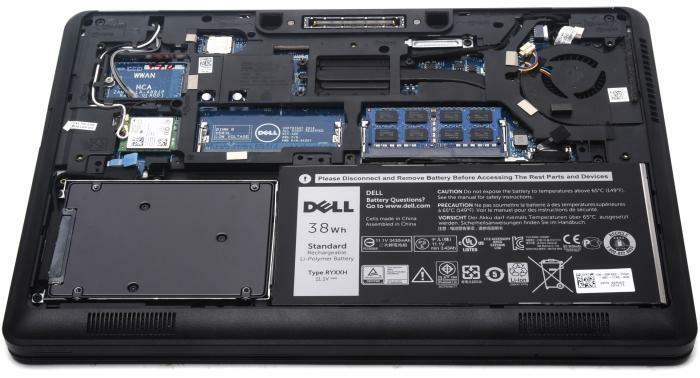 When compared to competing laptops such as the Lenovo ThinkPad X250, which is also a 12.5in model, the same configuration and services (such as a 3-year on-site warranty) for both models make the Dell a more attractive spend, albeit by about AU$60. Other things to note are that you get Bluetooth, a webcam, a vPro chipset, down-firing speakers (use them only if you must), and 802.11ac Wi-Fi (courtesy of an Intel Dual Band Wireless-AC 7260 adapter). When connected to our TP-Link Archer C9 wireless router, we witnessed short-range transfers of large files that were in the vicinity of 50MBps. So the question is, should you consider it? If a small, well-built, yet highly functional and comfortable-to-use laptop is needed for your business, then the Latitude E5250 is an excellent choice. We do have some qualms about its screen quality and the speed of its SSD, but unless you need a higher resolution IPS screen, and more overall speed, those things shouldn't bother you. • What's the difference between an Intel Core i3, i5 and i7?